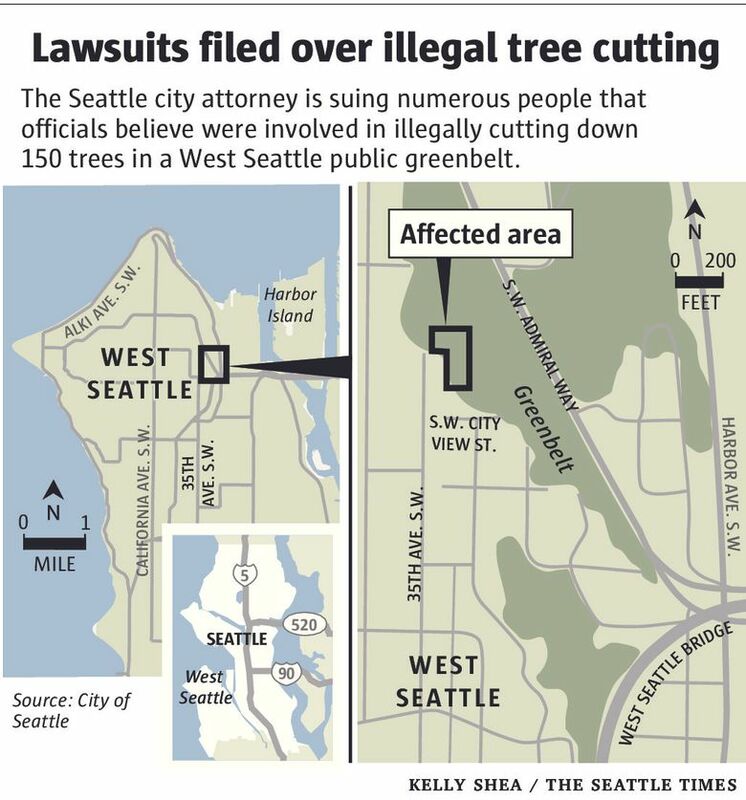 Seattle’s city attorney is suing as many as three dozen people for illegally cutting down more than 150 trees in a West Seattle public greenbelt. West Seattle homeowners accused of improving their views by illegally laying waste to more than 150 trees in a public greenbelt are now staring down more than $1.6 million in damages and fines. Seattle City Attorney Pete Holmes on Tuesday sued numerous people who officials believe were involved in cutting the trees near a block of view homes. Two lawsuits filed Tuesday in King County Superior Court, which cover different sections of the greenbelt, allege timber trespass, damage to land, trespass, negligence, environmental violations, parks-code violations and tree-management violations. City Councilmember Lisa Herbold, whose District 1 includes West Seattle, thanked Holmes for filing the suits. “The damages and penalties must be significant enough to deter this kind of activity in the future, so that those with financial means don’t see unauthorized tree cutting as a cost-effective way to increase their views and property values,” Herbold said in a statement. “These trees played an important role in maintaining soil stability in an environmentally critical area, and lessened the risk of landslides onto a major arterial … They also helped maintain air quality by absorbing carbon — an important issue in West Seattle, which sits adjacent to Sodo and the Duwamish industrial area,” she said. The suits identify six defendants by name and also list as defendants as many as 30 Jane and John Does. 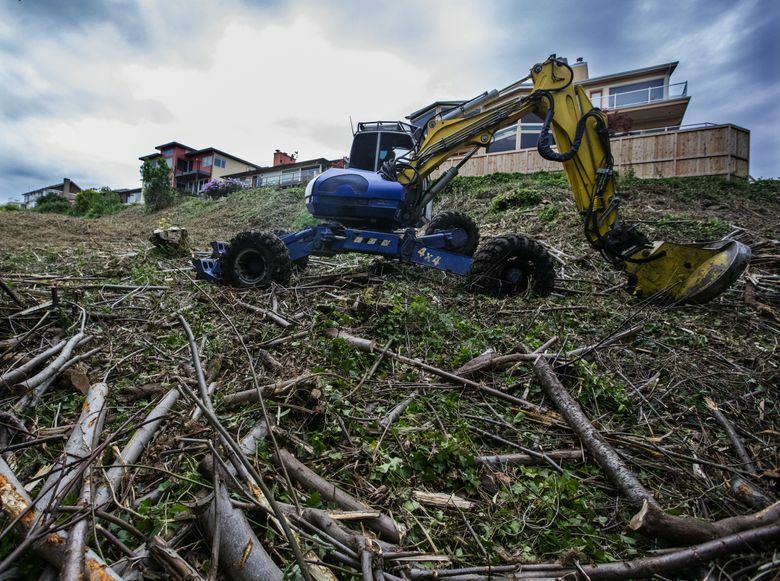 More than an acre of greenbelt on the hillside north and east of the 3200 block of 35th Avenue Southwest was wiped out, The Seattle Times reported in March. The downed trees of varying sizes include big-leaf maples and Scouler’s willows, and were left lying on the slope. No permits were issued to authorize the work. In March, Holmes said the people responsible for the cutting, including at least one homeowner, could face criminal charges — possibly even felony charges. He asked the Seattle Police Department to find out who ordered, paid for and carried out the destruction. “We launched an investigation to assess the extent of and identify the responsible parties,” Holmes said in a statement Tuesday. “To that end, we retained a consulting arborist to assess the damage and prepare a comprehensive restoration plan. “No one has yet come forward to give the city the full story of what happened despite SPD’s best efforts and extensive investigation. However, we are satisfied that we now know enough to proceed with lawsuits. We expect to learn that additional people, beyond those named in the lawsuits, were involved with the cutting as the suits progress,” the statement said. Holmes added that the criminal investigation is ongoing and police may at a later date refer the case to the King County prosecutor or his office for potential prosecution. One suit alleges Stanley J. and Mary E. Harrelson, along with Martin E. and Karrie Riemer, hired Forrest F. Bishop and John Russo to cut trees across from their properties. The other alleges Kostas A. and Linda C. Kyrimis, along with other homeowners, hired people to cut trees to improve their views. In a statement, a lawyer for the Harrelsons said they “deeply regret” the cutting that happened next to their property but are disappointed by Holmes’ decision to sue. “At no point did our clients request, or condone, the extent of the work that was done,” said the lawyer, Clayton P. Graham. Back in March, Graham revealed he was representing a homeowner involved in the cutting but at that time he refused to name the client. He called the cutting a mistake, saying his client and other neighbors hired a landscaping business to top and prune some trees to improve their views. Graham said his client was on an out-of-town trip when those trees were destroyed. Riemer, a longtime Seattle radio personality who co-hosts Marty and Jodi in the Morning on 95.7 The Jet, declined to comment Tuesday. Efforts to reach the other named defendants weren’t immediately successful. A decade ago, a federal judge paid the city a $500,000 fine and more than $100,000 in interest after his gardener cut down more than 120 cherry and maple trees in a Mount Baker park to improve the view from his home.